It was the last weekend day of working dog trials training of the year yesterday (see here for details) and I wanted to make something to take and share. I usually make a cake as everyone knows you have to eat lots of cake if you are standing in a muddy field with your dog all day! I did make a cake – a lovely carrot cake from the Great British Bake Off book – jumped ahead of my mission to cook my way through the book in an orderly manner – this is because I am not an orderly person – I will post about it later in the week. 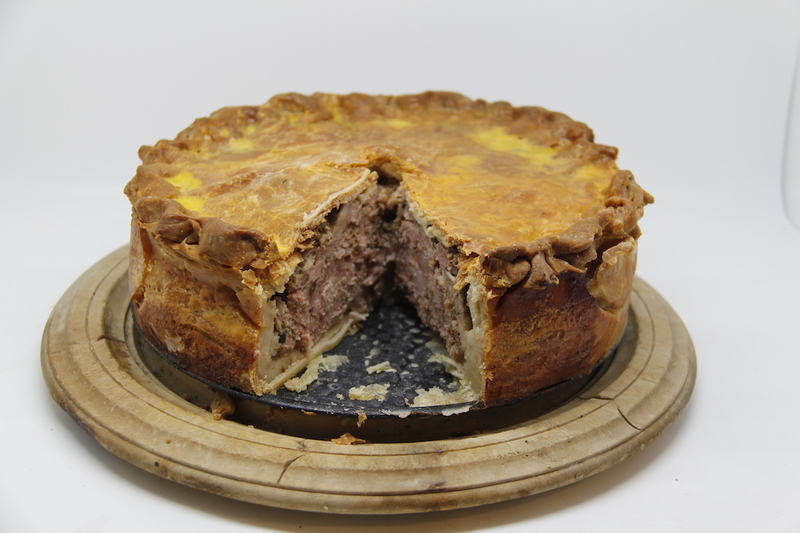 Today I want to talk about my pork pie. 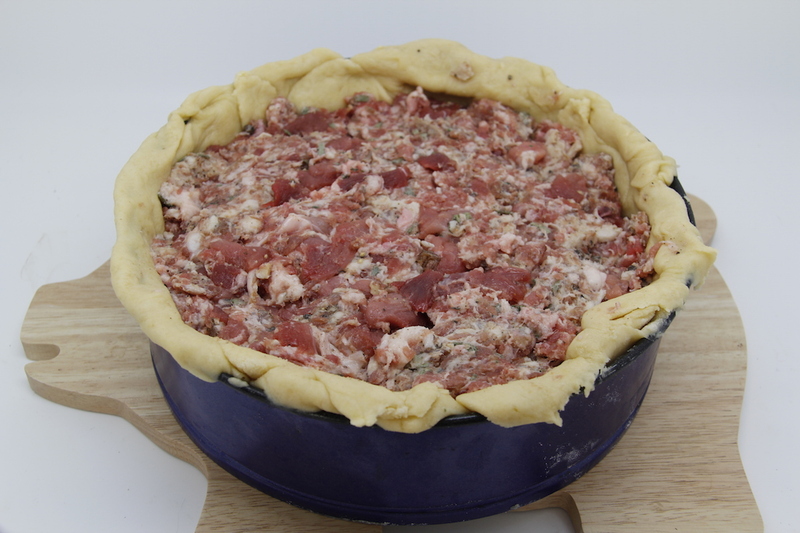 A Raised Pork Pie – 600g pork shoulder, 500g minced fatty pork (belly etc), 400g streaky bacon or pancetta (well after maggot-gate I had to use streaky bacon), 12 sage leaves (kindly donated by Pat as I killed my grandma’s sage bush this year and haven’t replaced it yet), leaves from two sprigs of thyme, 1 tsp salt (I used a lot less as the bacon was salty), 2 tsp ground pepper, 1/2 tsp ground mace, pinch of chilli powder, 250ml of pork stock that sets to a jelly (for this you need a trotter, few peppercorns, carrot, celery). 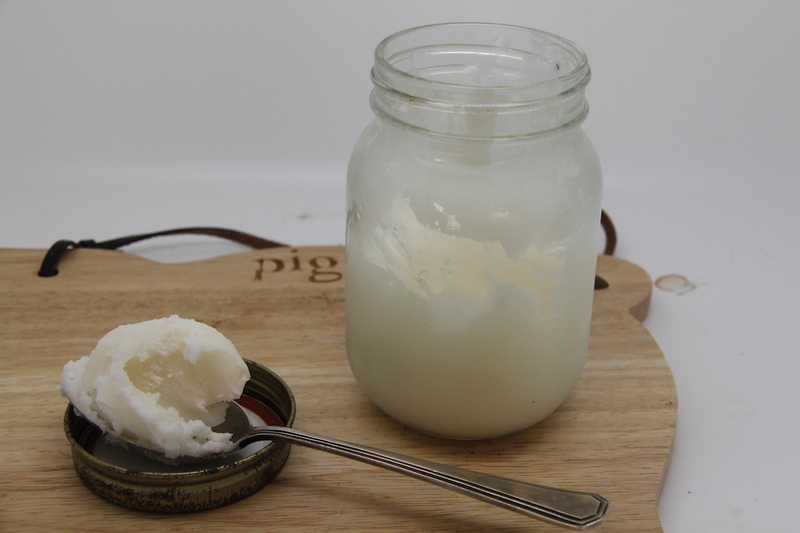 For the pastry 100g lard (I used my home rendered lard – see here – it is so so good and easy to make, so go on make some) 100g butter (still no cow or goat so we are have to buy butter), 200ml water, 550g plain flour, 2 eggs beaten and one extra for glazing, 1.5 tsp of salt. First make the jelly. Put the trotter and veggies in a saucepan with some water to cover and gently simmer for a few hours – top up the water if necessary. Strain and keep the liquor. 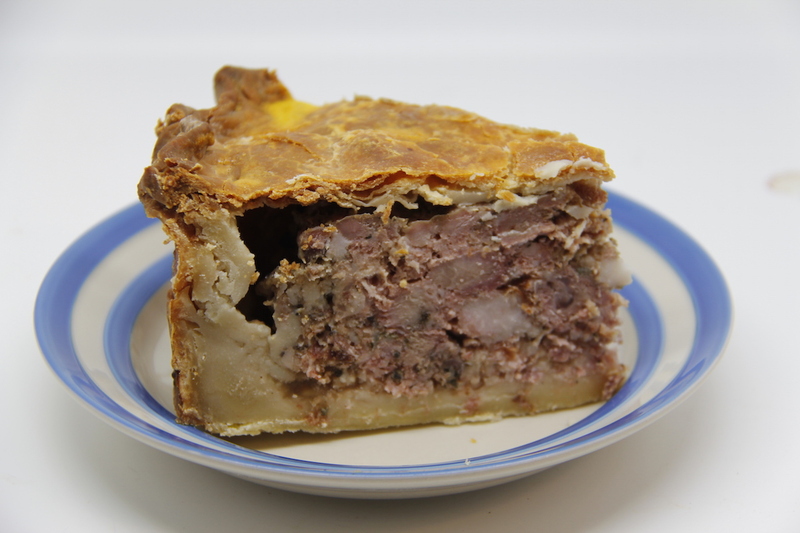 I stripped the meat, fat and skin off the trotter and added it to the meat for the pie. To make the pastry – put the lard, butter and water in a saucepan and gently heat until it has all melted, but don’t let it boil. Put the flour and salt in a bowl, make a dip in the centre and add the two beaten eggs. 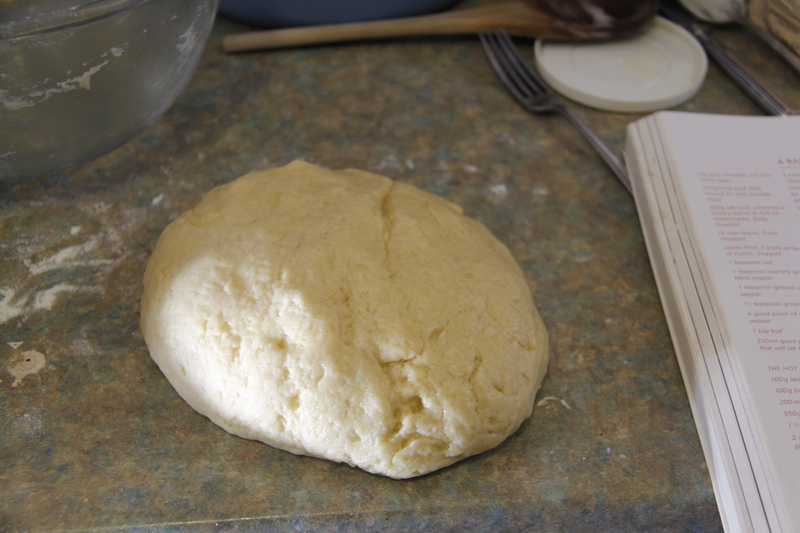 Stir gently with a knife and mix in the flour a little, then add the melted fat and water and mix to form a soft dough. It will be quite loose, but shouldn’t be sticky. You can add a little extra flour or water to get the desired consistency. Cover and chill for an hour. Meanwhile make the inside – chop the bacon/pancetta very finely – I put them in a food processor. 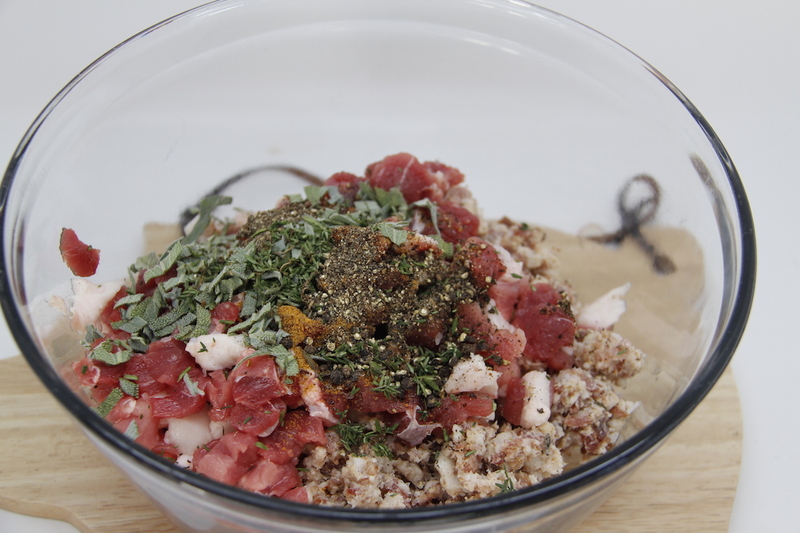 Put the bacon and minced meat into a bowl. Chop the shoulder into very small pieces and 5mm cubes – add to the bowl. Add in the spices and herbs and mix together. Assemble the pie – cut off 1/4 of the pastry and save for the lid. Roll the rest out and line a 20cm or so springform cake tin. 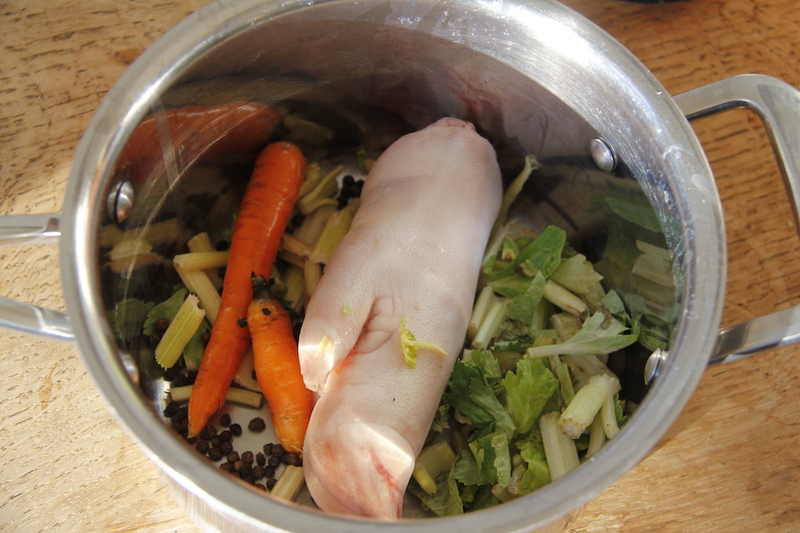 fill with the pork mix. Roll our the remaining pastry and put on as a lid. You can put some beaten egg round the edge to help seal it. Pinch all round the edges. Make a 1cm hole in the middle of the lid. Bake the pie in a hottish oven (180C) for 30 minutes. Then turn the heat down to 160C and bake for another 75 minutes. Then remove the pie, release the tin and take the edge off. Brush the pie with beaten egg and put it back in and cook for another 15 minutes. Remove the pie from the oven and leave to cool – I didn’t do this as I forgot. When it is cool melt 250ml of the jelly a little so it isn’t hot, but you can pour it and carefully, through a funnel, pour it into the pie. Then leave to cool and chill in the fridge. I poured the jelly in when the pie was hot – this meant the jelly got absorbed with the pie filling, which is fine, but there was no jelly layer on top. I also forgot to tilt the pie to distribute the jelly. Mainly I rushed this stage as my friends came round and I wanted to go and walk the dogs. I might use more jelly next time as I had some leftover, that I fed to the dogs – lucky them. The pie will keep for two weeks – mine lasted one day! N.B. you can see the gap that should be full of jelly – I think lots of it soaked into the pastry as well – it still tasted fabulous though.